(CNN) -- Thousands of passengers on a towed cruise ship will disembark in San Diego, California, Thursday with their own tales from a three-day ordeal that left them without air conditioning and hot showers. Their diet became Spam and Pop Tarts rather than steak and chocolate mousse. 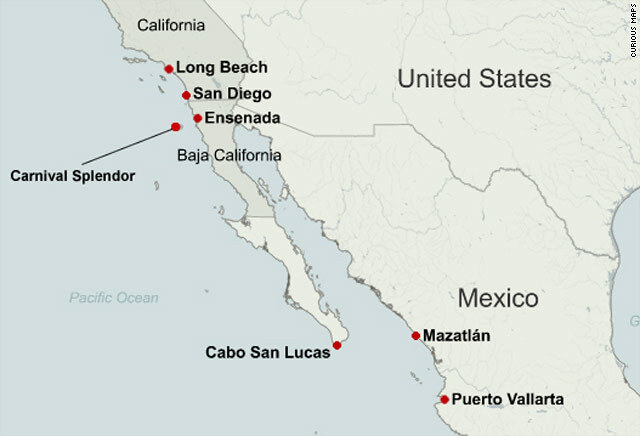 The vessel, which became stranded Monday after an engine-room fire off the coast of Mexico, is expected to arrive early Thursday, Carnival Cruise Lines CEO Gerry Cahill said at a press conference. Because the ship is without most of its power, the company decided to wait until daylight for five tugboats to deliver the Splendor to a dock, probably around midday, Cahill said. Nearly 4,500 people, including crew, are on board. Carnival noted that as the ship gets closer to the coast, passengers are increasingly able to receive "intermittent cellular service." The ship's crew set up a call center for passengers to make urgent calls. "Obviously, with eight phones and 3,300 people. you are going to have a pretty big backup," Cahill said. One passenger, David Zambrano, a KUSA-TV employee, called his Denver, Colorado, station Wednesday from his cell phone on the ship and said many passengers are in the dark in their cabins and have to wait in line for two hours to eat the cold meals, which are being delivered to them by helicopter from the USS Ronald Reagan. "Many of the people I have talked to said that they will never take another cruise again, especially with Carnival," said Zambrano, who was able to enjoy some sunlight because he has a stateroom with a balcony. "It's nothing like anyone expected, no," Zambrano said. "You stand in line for two hours just to get your food because everybody goes to the same place to pick up their food. And, so you stand in line and you wait, then once you get your food, you leave and you look for something to do. "People are playing cards. People are standing around just kind of talking. They're getting to socialize," Zambrano said. "It's not what you would expect on a normal cruise, of course not, but it's -- they're doing their best. The crew is doing their best to keep everybody satisfied and make sure that they're watching everything. "The only thing that made it really tough was when the facilities were all broken down and all the bathrooms weren't working and people were starting to get uncomfortable," Zambrano said. "But now that they started getting those things going and the water flowing, then that made all the difference." Carnival has already promised passengers a refund and a free cruise. The company also will cover transportation costs. "Conditions on the ship have been challenging," said Cahill, reiterating apologies to families. "We're disappointed about it. Reports from the ship show guests believe we are doing the best we can," Cahill said. "We ruined their vacations. I am optimistic they will return." Cahill said the crew has done the best it can in making the passengers comfortable, including offering free drinks. The pool was closed because the ship didn't have the power to run its chlorination system. Passenger Lenora Chavez said some of the plumbing was at capacity and that vomit bags are hanging in corridors. "It smells like a lot of people are throwing up," she said. "I can smell that a lot." Carnival told CNN that most of the plumbing works and that ship's doctors report few passengers are ill. The ship has almost 3,300 passengers and about 1,200 crew members. Navy pilot Tamara Graham and Chief Petty Officer Steve Sinclair said they made 15 round trips from the Reagan to the stranded cruise ship. "When we first showed up on scene, [passengers] were taking pictures, and flash bulbs were going off everywhere," Sinclair said. "Once we dropped our equipment, we were getting a lot of waves." The Reagan received 60,000 pounds of food, bottled water and supplies by airlift for the cruise ship, said Cmdr. Greg Hicks, spokesman of the U.S. Third Fleet. Graham said water "was definitely the top priority" on the list of supplies to bring on board the ship. 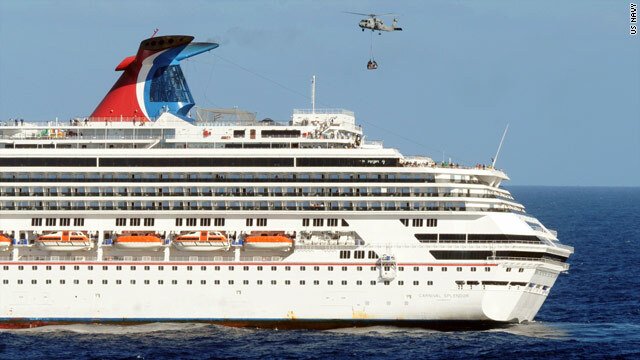 Carnival said it is making hotel and flight arrangements for guests once they reach port. About 100 representatives will be at the port Thursday to help passengers with transportation, hotel and other needs, Cahill said. Crews will follow environmental and sanitation protocols when they begin unloading food spoiled because of the loss of refrigeration, said Carnival spokeswoman Joyce Oliva. The fire occurred about 6 a.m. Monday in the aft engine room of the Splendor, the cruise line said Tuesday in a statement posted on its website. The blaze was extinguished, and no passengers or crew were injured. Engineers were not able to restore power to the ship, which was operating on auxiliary generators, a Carnival statement said. Key hotel systems, including air conditioning and hot food service were still not available Wednesday. "We've been in business for 35 years," said Cahill. "We've never had anything like this happen before." John Heald, Carnival's senior cruise director, blogged Wednesday from the Carnival Splendor. "I have to say that the crew has been absolutely epic and I am so very proud of each and every one of them," he wrote. "One thing is for certain though," Heald added. "I doubt anyone onboard will ever, ever want to eat a sandwich ever again." CNN's Melanie Whitley, Holly Yan, Brian Todd and Alan Silverleib contributed to this report.